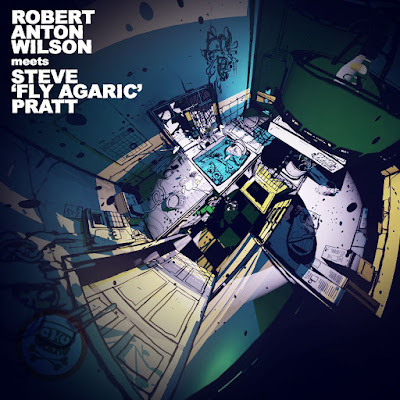 From Steve 'Fly Agaric' Pratt via Twitter comes the news of a new release from Iron Man Records, Robert Anton Wilson Meets Steve 'Fly Agaric' Pratt. (It was released on June 23 but I did not know of it until I saw a Tweet yesterday from Steve). The new release preserves Steve's interview with RAW back in 2002; for a long time, Steve had misplaced part of the interview. He explains, "In 2015 I was digging for a minidisc of DJ Fly material for use on my Fly By Night radio shows, produced for Radio Free Amsterdam. While sifting through the discs I noticed one with writing in light pencil that read: R.A.W 10th September 2002. I popped it into the player, and to my delight it was the first half of the interview. I edited and boosted the sound files to the best of my ability, and added a selection of music from friends and past collaborators, resulting in what you hear right here." You should read Steve's whole post about the encounter, which offers a charming portrait of my favorite writer: "“Would you be so kind as to grab me a coffee, it’s in the pot” he said. “Sure”. I fetched a mug, which had a quote from Hannibal Lecter printed on it, filled it with black coffee and set it down on the table, sitting opposite Bob." I'll buy a copy as soon as I can; as of this writing, it hadn't popped up yet on Amazon, at least in the U.S.
See also my 2012 interview with Steve, one of my favorite interviews I've ever posted here; you can see a photo of Steve with RAW, also the photo that ran in the "New York Times," showing Steve serving customers in an Amsterdam marijuana shop. And if you've never done so, take a look at his RAW360 tribute site.